Prayer is both a spiritual discipline and a holy habit. Sometimes a seasons of changing routines can break good habits or provide opportunity for start a positive new routine. That’s what I love about prayer calendars, especially for kids launching into a new year of school. Our friends at Children’s Ministry Deals have posted this eye catching free printable calendar. 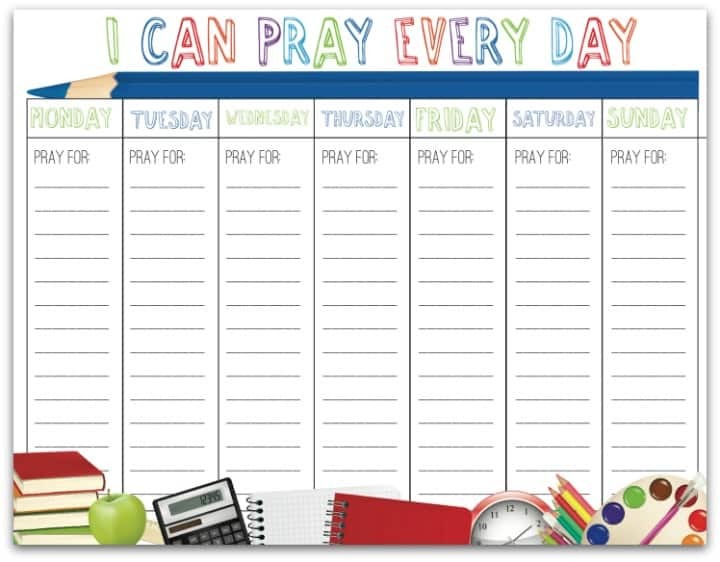 It’s designed to get kids into a better prayer and quiet time routine as they learn to manage the new school calendar. It’s a free download on their website. To get this printable resource, you need to visit their site (click the link above) and select ADD TO CART. Then you’ll go through the easy checkout process, except you don’t need to enter payment details because the item is free. I love it when leading curriculum publishers offer freebies like this online! This is an item that’s been on their website for a few years. They have kept it free but updated it each year after reader feedback and to keep it fresh. It’s a solid resource. I could imagine Christian teachers sharing this in their classroom or church leaders handing this out in their family ministry. This would be a great add-on to any of our free lesson plans about prayer. Thanks for the encouragement on how we can ministers to our children. Continue to allow God to pour into u his heart for children all over the world with the gift to help and train up others to be better leaders when teaching our children. Thank You!!! Praise the Lord, thanks for strengthening us. Tony Kummer (Editor) reviewed & updated this page on : August 9, 2016 at 10:15 am. All our content is peer reviewed by our readers, simply leave a comment on any post suggest an update.